Low prices. OrangeSmile.com offers car hire service in Brazil on the lowest-rate-guarantee basis, since we work with car suppliers directly. For your search criteria in Brazil, we always select and show the best rental offers. The car reservation process consists of 3 simple steps: (1) search for available cars for your dates in Brazil; (2) select your car type; and (3) fill in the booking forms. Once the reservation is completed, you will receive a confirmation voucher to your email address. During the booking process, please check your rental conditions. To pick up your car at the rental point in Brazil, you need to provide our confirmation voucher, your driving license and a valid credit card. The final payment is normally carried out at the pick-up point. Our car hire points in Brazil accept VISA, MasterCard, etc - please check your rental conditions. At the pick-up point, please read the handling manual and check the car for present defects. OrangeSmile.com wishes you a pleasant journey to Brazil! The car hire reservation system OrangeSmile.com allows renting a vehicle in Brazil within 10 minutes. Our largest database of car suppliers enables us to provide you a rental car in Brazil at the cheapest rate ever possible. At rental locations in Brazil we offer the following car sizes: mini, compact, economy, standard, premium and luxury. The following car types are available in Brazil: Sedan, Hatchback, Jeep, Cabriolet, Coupe, Minivan and Minibus. A country of colourful carnivals and festivals, Brazil attracts guests not only because of its fantastic celebrations, but also with its numerous places of interest. The capital of Brazil, Rio de Janeiro, remains the most visited city of the country. Without a doubt, Rio is internationally known by its symbol – the Statue of Christ the Redeemer that is located on the top of Corcovado Mountain. The statue is a part of National Park that occupies a plot of land of more than 3 thousand hectares. There are more than ten interesting museums in Rio de Janeiro. Tourists are recommended to visit the Museum of Modern Art, the Museum of Indians, the National Museum of Fine Arts, Ethnographic Museum, the Museums of History and Art, the Museum of Stones and the Museum of Republic. Guanabara Bay is considered the most beautiful place of the capital and features fantastic views. There is a small town of Buzios not far away from Rio. The town is mostly famous for its secluded bays, cosy parks and beautiful botanic gardens. Football fans simply cannot leave Brazil without visiting Sao Paulo. This is where the legendary stadium Pacaembu is located. The “king of football” Pele played at this stadium. 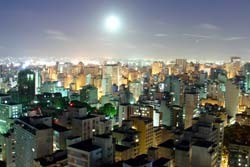 Many people call Sao Paulo a “miniature Chicago” because of numerous skyscrapers and buildings with glass walls. Many of these high rise buildings have observation decks installed on top floors. The city of Brasilia is home to numerous landmarks. Sometimes the city itself is called a unique architecture project. From a bird’s eye view the shape of the city resembles an airplane. Every part of the “airplane” has its specific purpose – wings are residential quarters, administrative and cultural centres are the body. There is a large botanic garden in Brasilia, and tourists with kids are recommended to visit the local zoo. Finally, fans of architecture places of interest will like an excursion to Metropolitana Cathedral. Amazonia is the most mysterious and picturesque region of the country. This part of Brazil is rich in dense tropical forests, fast rivers and crystal clean lakes. Amazonia is often called “the lungs of the world” – there are simply no so many trees and plants anywhere else in the world. During many years of work, scientists have managed to detect and explore only a third of all plants that grow in Amazonia. Rental offices in Brazil are often picky to delays in returning the rented cars, so it is better to arrive at the office on the specified time.